For one night only (6 June 2017) in the Back Room bar they showcased 2017’s burgers from around the world and cocktails. Thanks to Hard Rock Café who let the community of Love Pop Ups – London come down to eat the many various burgers which are from around the world. Read all blogs/reviews from the comments section below. What an amazing opportunity to go to this unique event @ The Back Room @ The Hard Rock Café in Piccadilly via LovePopUps London for The World Burger Tour, we were luckily enough to sample 4 Unique burgers whilst on tour in London. “To celebrate the third year of World Burger Tour, we thought it was important to share Hard Rock’s heritage with guests, and what better way to do that than through our Local Legendary Burger collection,” Darryl Mickler, Senior Director of Research and Development for Hard Rock International, said in an emailed statement. “For a limited time, guests from around the world will now be able to taste the unique flavours from cities like Cartagena, Colombia or Seoul, South Korea, without ever leaving their hometown Hard Rock,” Mickler continued. I Think my favourite one was the Colombian Plantain Burger, very sweet and juicy. And the prize was a meal for 2 in the Hard Rock Café, unfortunately I didn’t even come Close with my guess @ 53mins and 30 Seconds, she demolished all 4 of them in just Over 10mins amazing! 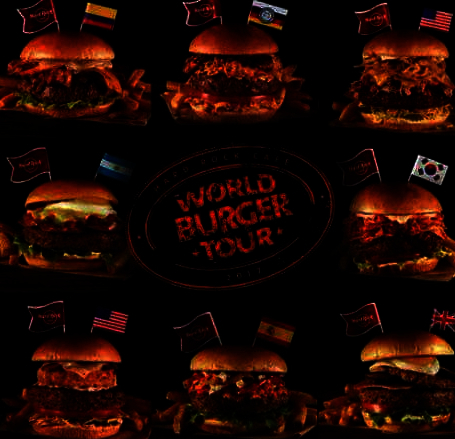 There are plenty of locations in the UK and Worldwide throughout May and June for this tour, so checkout their website http://www.hardrock.com/promos/WorldBurgertour2017 for more details and you could be lucky enough to sample them. Thank you to LDC Comms PR and LovePopUpsLondon for this unique opportunity. The Back Room had the coziness of a homely living room, with a bar! This is part of Hard Rock Cafe London and they have launched the World Burger Tour featuring a range of their legendary burgers. So without travelling miles, we can have these congregation of international flavours under one roof. I am thrilled to be part of LovePopUps London attending Hard Rock Cafe’s third year series of their World Burger Tour. It was a proper press event with burger fans, some famous burger social media names and a surprise entertainment element of Emma (compulsive burger eater on YouTube) eating her way through the four normal portions of the Hard Rock Cafe’s hamburger with a record time of about 13 minutes. A slight niggly feeling is that when cocktails were promised at such press event, it was a downer to be told we had to purchase it instead. The four burgers we had that night was the English Breakfast Burger, Colombian Plantain Burger, Jambalaya Burger and Kimchi Burger. I cannot tell which my favourite was because I liked the rice cake from the Jambalaya Burger, that Kimchi kick from Kimchi Burger, aioli from the Colombian Burger and the authenticity of the English Breakfast Burger. If only I could build my own burger. Burger fans, Hard Rock Cafe fans, listen up. The World Burger Tour is not just limited to London. It is a global event. Four burgers are launched every month but time is limited, so you better hurry! The World Burger Tour 2017 is happening now where each month Hard Rock Cafe releases 4 burgers influenced from around the world. Myself and 5 friends got to taste next month’s burgers, available from Sunday 25th June 2017. All the burgers were taste tangling good.